Come join us to mingle and meet other expat newbies as we host our April Newcomers’ Event at the Globe. Here you learn about everything the InterNations Copenhagen Community has to offer. Let us tell you about our Copenhagen Community, about our more than 29 InterNations Groups which are waiting for you, and about our great official events. You will also have the chance to break the ice and get to know the other newcomers during the game session specially designed for the Newcomers’ Event. The InterNations Copenhagen April Newcomers’ Event will be held in the Library Area of The Globe Irish Pub. 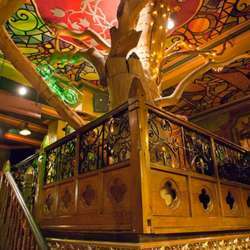 The Globe has three bar areas to suit every mood: the Tree bar, so-called because it sits around the base of a thirty-five foot high tree. Next is the Library, constructed from and old Irish Church situated in County Mayo. Finally, the Main Bar, the party bar.